It is time again for Samantha Walker's Creative Team Blog Hop and giveaway! Samantha Walker will be having a blog hop once a month where her Design Team will be sharing their creations with her brilliant products! If you are coming from Samantha Walker's website, welcome! If not, you can start the hop here. 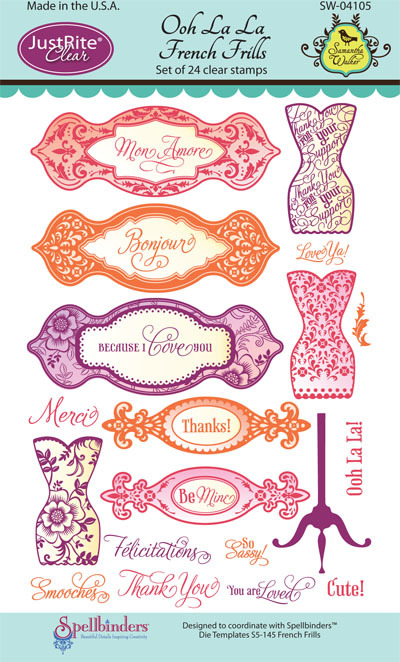 I am so excited about the prize because Samantha Walker is giving away an Ooh La La French Frills Just Rite Clear Stamp Set! Read on to see how to win. Although we don't celebrate Halloween in our home, I still love the fall season. I also love a good challenge! 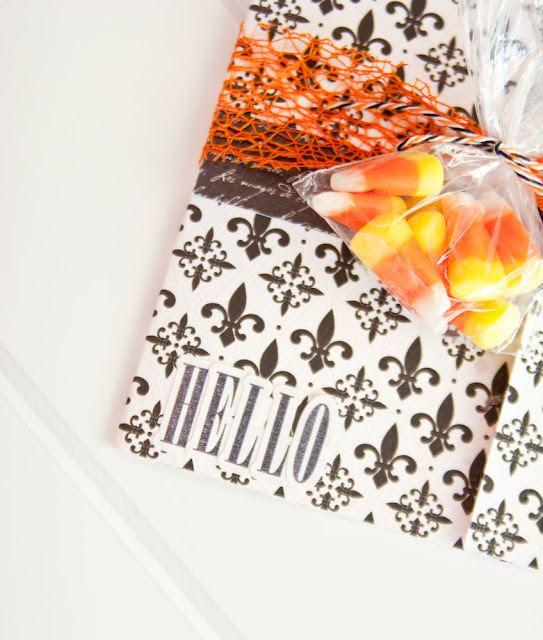 I took this month's Halloween theme and took advantage of using Samantha Walker's Paris Girl Collection to make some fun fall cards! This first one is created match-box style. Black and white is classic and these patterns are perfect to match any ribbon for any season or holiday. I added twine and a little treat. Who wouldn't love to get a card with some candy corn?! 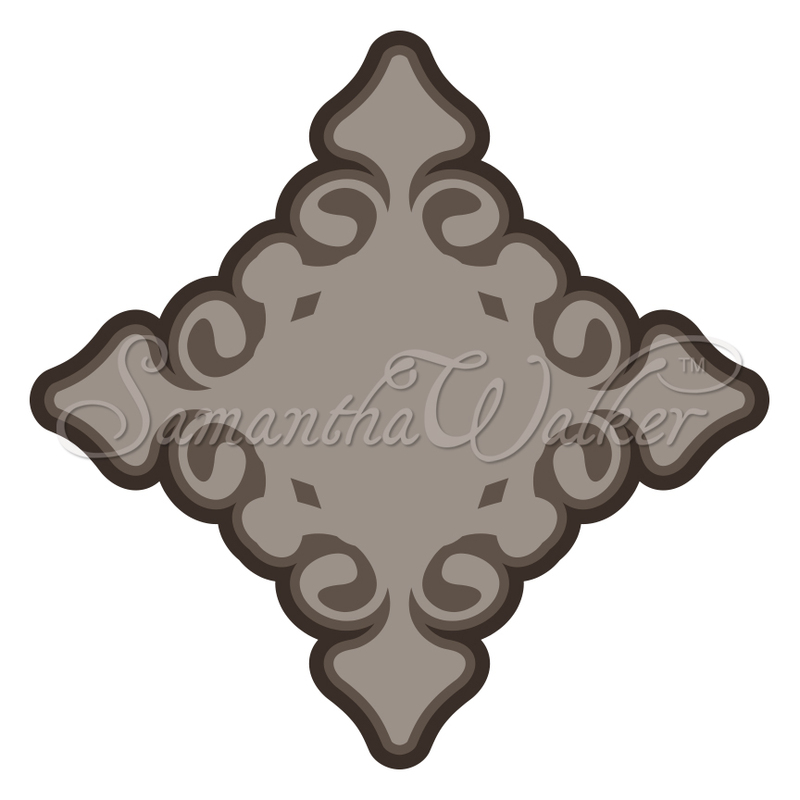 For my second card, I kept it clean and elegant, just like Samantha Walker's style! Again, these colors are perfect to match any ribbon to and give the card a modern look. To enter to win this Samantha Walker stamp set, just leave a comment on my blog between 12:01am October 10th and 11:59 pm October 14th, 2012. Winner will be announced on Samantha's Facebook page on Monday, October 15th. Create Well: Use patterned papers to create holiday cards by matching traditional holiday colors with the papers for a classic look! 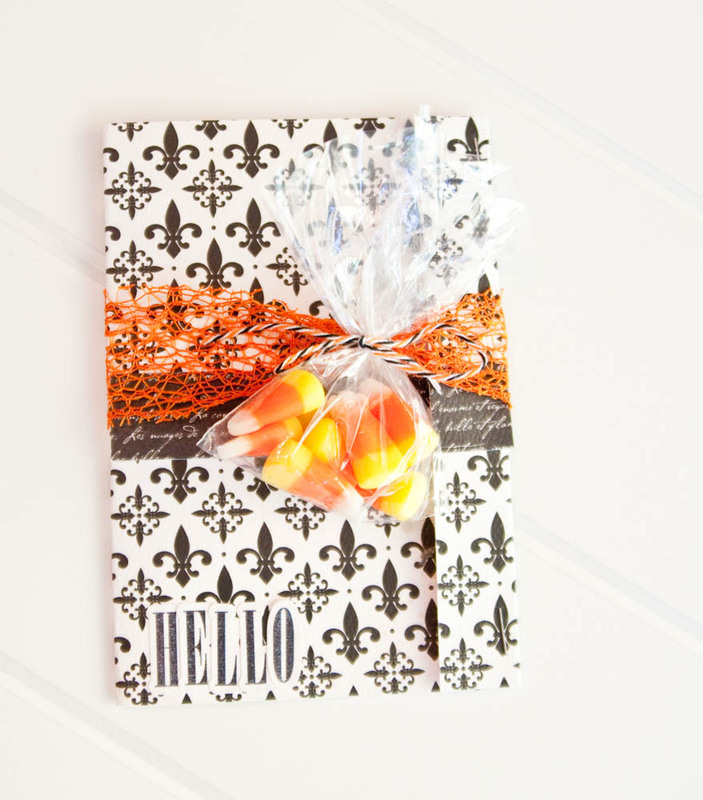 I love the tied package of candy corn on the card. What a clever idea ! Love it! Especially the little bag of candy corn! Love these cards. You have found a way to make Paris Girl into a wonderful fall projects! Very classy and I like the bag of candy corn--my favorite candy. LOVE LOVE LOVE your projects! 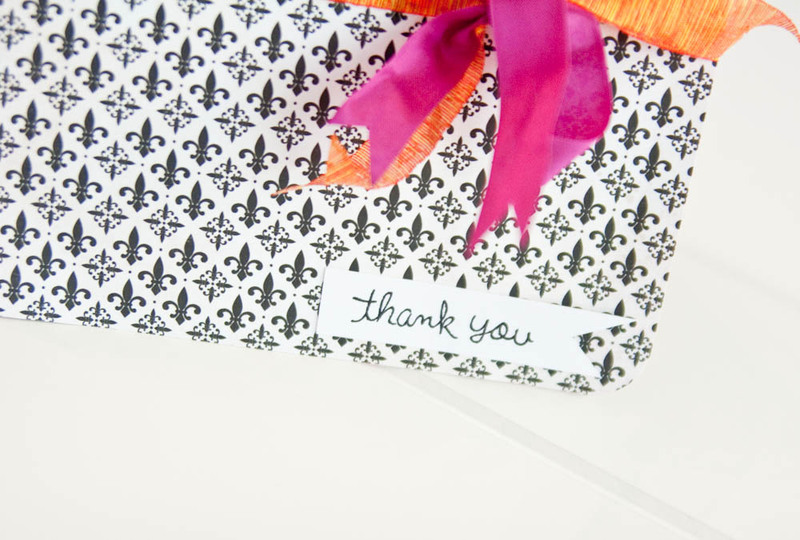 And that fleur de lis paper has stolen my heart! I have a 10 year old little Saints fan whom I have taken lots of photos of in his Sunday Saints wear! LOL..I need that to scrapbook some photos! OMG-- absolutely love this. 2 of my favs fleur de lis and tulle! The cards are awesome! I love the pink & orange. The cards are fabulous! I love the pink & orange. Very creative card, thanks for sharing! Lovely projects, and you are right - everyone needs a little treat! Great idea! Your cards are beautiful for the season! Jennifer these cards are wonderful I love the mix of bold pink& orange ribbon ! Jennifer these are simply divine!